My name is Julie McCoy and I have been a member of the Chillicothe, Missouri, Rotary club for 27 years. My husband Rolfe and I have three beautiful daughters and 4 exceptionally bright grandchildren. While I love them all dearly, I look forward to being your District Governor for the 2018-19 year. First, let me say thank you to the outgoing District Governor, Allen Garner, District 6040 Officers and all the District 6040 Club Presidents. This past year has been memorable under their leadership. And, we have truly “made a difference” in our state and around the world. Thank you all for your service! Next, I’d like to congratulations to the new officers serving in the 2018-19 year. I am looking forward to working with you each of you. In fact, I look forward to meeting all 2400 Rotarians in our district. I want to see and learn what great things are happening in your communities. This year’s theme was set by Rotary International President, Barry Rassin. He has asked each one of us to Be The Inspiration…in our clubs, in our communities and around the world. And, I have no doubt that District 6040 Rotarians will inspire others to success as we continue to work towards service on behalf of others. I look forward to an Inspiring year ahead! The Kimbrough Challenge will bring $700,000 in Rotary Grant dollars to District 6040 and around the world. Past District Governor Larry Lunsford comments on the Legacy Centennial Dinner and the origins of the Kimbrough Challenge. The first in a series. The Kimbrough Challenge will bring $700,000 in Rotary Grant dollars to District 6040 and around the world. Marc Horner, District Governor 2019-2020 comments. The second in a series. Rotary is made up of People of Action. In 2018, Rotary clubs throughout northern Missouri have been hard at work on grant-funded projects that improve lives throughout the District. If you want to make a real difference in your community, join your local Rotary club! Rotary is 1.2 million passionate individuals in 35,000+ clubs worldwide. We are both an international organization and a local community leader. The 18th annual “shoes season” is off and running. We are two months away from the Shoes Caravan (April 25-27), and Caravan Driver John Gill and I have developed a tentative Shoes Caravan schedule. Both UPS and Burlington Northern Santa Fe Railway have again agreed to assist us with the transport of your shoes to Dallas, to be prepared for international shipment. Our UPS truck drivers, Patrick and Roger, will be with us again. It was a resounding consensus at our fall 2018 District Conference to send our shoes this year to KENYA, along with some distribution in the UNITED STATES. We will have our annual SHOES ROLL CALL OF CLUBS on April 27th at the District Assembly in Cameron. Our plan is to have the “John Gill trailer” at the District Assembly…with our traditional Shoes Caravan to precede with a few stops on Wednesday, April 24, then full days on Thursday, April 25, and Friday, April 26, culminating at the District Assembly in Cameron on Saturday, April 27th. Women in Rotary, please join me for the first ever Power of Women in Rotary event. We will celebrate of the first time in history that Missouri Rotary has been governed by four Women. Linda, Susan, Jayne and I have set aside Saturday, May 11th as a dynamic day to learn about women in service and women in leadership. The cost is only $25 and I can assure you, it will be an action packed day. Space is limited; so, please sign up at tinyurl.com/WIRConference. I look forward to seeing you there! Welcome to the District 6040 Website ! Click here to search for a member in District 6040. 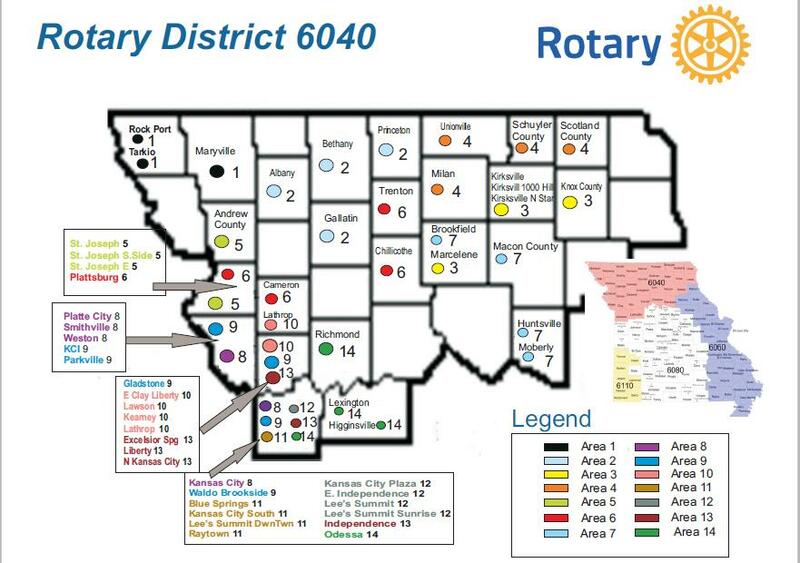 Rotary District 6040 represents the Rotary clubs of Northern Missouri. Our district also provides leadership opportunities and training for the Rotary members in our district. This website is dedicated to providing the Missouri Rotary members, or Rotarians, resources and information. Rotary is a non-profit organization dedicated to bringing together local leaders to take action in bettering the world through humanitarian service. We are local business leaders and community leaders who believe that no single action is too small, and no great idea is too big.